World Health Organization (WHO) guidelines recommend for children with severe acute malnutrition (SAM), high-dose vitamin A (VA) supplements be given on day 1 of admission, and on days 2 and 14 in the case of clinical signs of vitamin A deficiency (VAD). Daily low-dose VA follows, delivered in a premix added to F-75 and F-100. This study aimed to systematically review the evidence for safety and effectiveness of high-dose VA supplementation (VAS) in treatment of children with SAM. A comprehensive literature review was undertaken for all relevant randomized controlled trials (RCT) and observational studies from 1950 to 2012. Studies identified for full review were evaluated using the Grading of Recommendations, Assessment, Development and Evaluation (GRADE) methodology using a set of pre-defined criteria: indirectness; inconsistency; imprecision; and study limitations. A quality rating of high, moderate, or low was then assigned to each study, and only those attaining moderate to high were considered in making recommendations. Of the 2072 abstracts screened, 38 met criteria for full review, and 20 were rated moderate to high quality. Only one study replicated the WHO VA protocol in children with SAM. Indirectness was a critical limitation, as studies were not exclusive to children with SAM. There was inconsistency across trials for definitions of malnutrition, morbidities, and ages studied; and imprecision arising from sub-group analyses and small sample sizes. Evidence showed improved outcomes associated with low-dose compared to high-dose VAS, except in cases presenting with signs of VAD, measles, and severe diarrhea or shigellosis. Adverse outcomes related to respiratory infection, diarrhea, and growth were associated with high-dose VAS in children who were predominantly adequately nourished. No adverse effects of the high dose were found in children with SAM in the trial that replicated the WHO VA guideline. This is the first systematic review of the safety and efficacy of high-dose VAS in treatment of SAM. We recommend a low-dose VAS regimen for children with SAM, except in cases presenting with measles, severe diarrhea (shigellosis), and any indication of VAD. Further research is needed in exclusively malnourished children and to explore alternate delivery strategies. Globally, vitamin A deficiency (VAD) affects 100–140 million children, 4.4 million of whom have xerophthalmia [1, 2]. Coverage rates for full vitamin A supplementation (VAS) of children 6–59 months delivered through primary care have risen significantly over the last decade, reaching 88% for the least developed countries . In recent years, alternative strategies to improve micronutrient nutrition have been increasingly applied for high-risk populations already supplemented with vitamin A (VA): micronutrient powders; fortification of staple foods; ready-to-use supplemental and therapeutic foods (RUSF and RUTF); and other food-based approaches. Among the populations particularly vulnerable to VAD are children with severe acute malnutrition (SAM) . The World Health Organization (WHO) currently recommends that for inpatient care of children with SAM, VA supplements be given on day 1 of admission unless there is clear evidence that VA was received in the last month . Dosing guidelines are the following: 200,000 international units (IU) for children over 12 months of age, 100,000 IU for children 6–12 months, and 50,000 IU for children below 6 months. If clinical signs of vitamin A deficiency are present, then another age-specific, large dose is administered on day 2 and again, on day 14 [4, 5]. Low-dose VA is then given as part of a vitamin mix added to F-75 or F-100 therapeutic milk formulations, or alternatively, as a proprietary multivitamin supplement or combined mineral-vitamin mix (CMV). There is a need to revisit these guidelines in the context of improved VA availability, but also in view of evidence showing the potential for harmful effects of such VAS dosages . This systematic review aimed to assess the safety and effectiveness of VAS in children with SAM, with regards to mortality, nutritional recovery, and signs of symptomatic VAD . A literature review was undertaken to search for all randomized controlled trials (RCT) and observational studies published from 1950 to March 2012. Databases searched included MEDLINE, EMBASE, and Google Scholar. The clinical trial registries at clinicaltrials.gov, pactr.org, and apps.who.int/trialsearch were also searched. Initial key words for the searches included “malnutrition”, “severe malnutrition”, “kwashiorkor”, “marasmus”, “vitamin A”, and “retinol”. A number of outcome measures were sought, including mortality, weight gain, nutritional recovery, and VAD. Further terms were added iteratively to the search based on results obtained from the initial searches. Searches were also conducted to identify relevant publications and study documents produced by international health organizations such as the WHO and UNICEF. The titles and abstracts were scanned to identify relevant studies. The full text of relevant studies was obtained and the list of articles for inclusion further optimized based on an evaluation of the full text. Reference lists in relevant articles were also scanned manually and electronically to identify other studies that may have been missed in the original searches. Relevant publications that cited those previously identified articles were similarly sought. Studies were included for full review based on relevance to the population of interest, study interventions, study design, outcome measures, and an assessment of the study’s methodological rigor and quality. These studies were then assessed and entered into a Grading of Recommendations, Assessment, Development and Evaluation (GRADE) table summarizing design, aim, outcomes, GRADE criteria assessment (indirectness, inconsistency, imprecision, and study limitations), and quality ranking (high, moderate, or low) . Indirectness was judged based on study relevance to the review question in terms of the study population (children with SAM), intervention of interest (VAS), and outcome measures (mortality, recovery from SAM, signs of symptomatic VAD, and adverse outcomes due to supplementation) . Consideration was given under this category to VA dosing relative the WHO protocol. Inconsistency was assessed by comparing point estimates and examining the heterogeneity of methods and statistical analyses . Imprecision was based primarily on the 95% confidence interval with consideration of effect and sample sizes . Potential biases (selection, recall, information/observation, misclassification) arising from failure to blind, losses in follow-up, inappropriate controls, and failure to adjust for confounding factors, among other problems, were considered under the study limitations (risk of bias) criteria . Once these criteria were assessed, each study was assigned a quality ranking ranging from low to high. Only those studies with some degree of moderate or high (i.e., low-moderate, moderate, moderate-high, or high) quality ranking were included in this review for consideration in making recommendations on the use of VAS for the treatment of children with SAM. Of the 2072 abstracts identified and screened, 38 were selected for full review (Figure 1). Twenty-two were of moderate- to high-quality, and were grouped into 3 categories and listed primary outcomes assessed: 1) previous reviews; 2) observational studies; and 3) randomized controlled trials (RCT). Flow diagram for studies included in review. The figure presents a flow diagram detailing the number of records screened and excluded, full-text articles reviewed, and ultimately, the number of studies included in the systematic review. The included observational and RCT studies are enumerated according to the primary outcome examined. Two previous reviews of VAS trials were identified; both considered malnourished children together with those not malnourished [7, 13]. Preventive VAS reduced all-cause mortality by 25% and diarrhea-specific mortality by 30%. VA showed greater protection against morbidity and mortality in Asia than in Africa or Latin America . An earlier review found that the severity of measles and diarrheal infections were reduced by VAS, but the risk of lower respiratory tract infection was increased in some trials . Because the reviews did not provide new evidence for VA and management of SAM and all studies from the reviews were screened for this review, they were not included in the GRADE assessment. Five observational studies were identified and assigned a GRADE quality ranking of low to moderate [14–18] (Additional file 1: Table S1). These studies found significant associations between serum or plasma retinol concentrations and SAM [14–16]. Others established a link between VAD, SAM, and diarrhea. In Bangladesh, reduced serum retinol concentrations were associated with shigellosis and low weight-for-age Z-score . Another case–control study in Bangladesh showed that the duration of diarrhea and SAM were independently associated with xerophthalmia . Fifteen RCTs of moderate to high quality based on GRADE criteria were included in the systematic review on the safety and efficacy of high-dose VAS in children with SAM (Table 1). Issues of indirectness were present in all trials. Only one trial included children with SAM exclusively . The remaining 14 included non-malnourished and malnourished children [20–33]. VA dosing also varied; only five trials administered the recommended high-dose on day 1 [19, 26, 30, 31, 33], while the remaining administered VA doses in varying quantities and forms. Only one trial followed the WHO protocol ; two compared high dose with daily low dose [26, 33], and the remaining 12 compared high dose VAS with placebo [20–25, 27–32]. Secondary outcome examined and found no increased risk of adverse events VA toxicity and morbidities. The table presents the included RCT studies in the review by date of publication, from most recent to oldest. For each study, the design, aim, quality assessment by GRADE criteria, findings, and GRADE rating are provided. Inconsistency across trials was observed with regards to the ages of children studied, ranging from birth to 14 years. Definitions of morbidity and malnutrition varied, as well as use of differing growth references and standards. Small sample sizes and rare events were the most common problems related to imprecision. Despite randomization, several studies also showed significant differences in baseline characteristics that elevated the risk of bias. Notably, these included baseline age and nutritional status differences with higher likelihoods of confounding [28, 32, 33]. Some key findings were identified across trials. First, low-dose VAS conferred more or similar health and recovery advantages when compared to high-dose supplementation in the treatment of malnourished children [19, 26, 33]. Second, high-dose VAS showed mixed results relative to placebo for infectious disease outcomes in children with and without SAM, showing benefit in some trials for children with severe diarrhea or shigellosis [27, 31], measles [21, 22], other acute respiratory infections , and undifferentiated fever . However, in other trials, there was no benefit for children with acute respiratory infections or diarrhea [24–26, 29, 32]. There was also some evidence of improved growth outcomes associated with high-dose VAS among VA deficient children  and children with measles . Finally, adverse effects were found to be associated with high-dose VAS in some trials, including an increased rate of respiratory illnesses [23, 28] and diarrhea [26, 31]. These findings appear primarily in samples or sub-samples of adequately nourished children. As noted previously, we identified only one RCT that included only severely malnourished children . Some explicitly excluded children with marasmus, kwashiorkor, or all children with SAM [25, 27, 30, 32], while the remaining included both malnourished and adequately nourished children. Among the five studies finding adverse events in association with VAS, two of these studies carried out sub-group analyses showing an increased risk of diarrhea among normally nourished children  and among children without edema . One trial included only adequately nourished children , another found increased risk of ALRI in mainly adequately nourished children , and one included both malnourished and adequately nourished children, excluding children with SAM . No adverse effects of the high-dose VAS were found in children with SAM in the trial that replicated the WHO VA guidelines . Our systematic review of the literature using the GRADE methodology revealed only limited evidence that directly addresses the safety and effectiveness of high-dose VAS for children with SAM. Fourteen of the 15 RCTs identified for this review included both malnourished and non-malnourished children, thereby complicating the extrapolation of findings directly to efficacy and safety of VAS for SAM. There is sufficient evidence to recommend the use of high-dose VAS for children with SAM when presenting with measles, severe diarrhea (shigellosis), or evidence of VAD. The low-dose VAS regimen should be considered as the preferred protocol in other cases of malnourished children, given the potential for adverse events and similar recovery outcomes when compared to high-dose VAS. 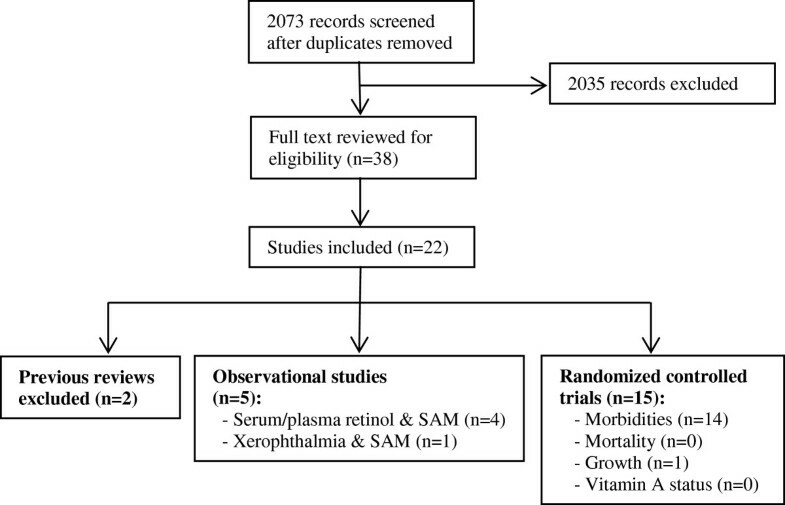 Higher quality prospective studies are still needed to directly examine VAD in children with SAM, applying more contemporary definitions of morbidity and malnutrition, and powered sufficiently to detect the critical outcomes of interest. Observational studies demonstrated an association between SAM and VAD, but metabolic disruptions in SAM might preclude accurate measures of true VA status. Blood biomarkers of retinol concentrations were primarily used to indicate VA status [14–16, 18]. Protein-energy malnutrition has been associated with reduced hepatic synthesis of retinol binding protein (RBP) and transthyretin used to transport VA in the body [34, 35]. Thus, VA stores in the liver may not be mobilized appropriately in malnourished children and therefore not be reflected in blood biomarkers. Mitra showed that VA status improved from baseline to hospital discharge, even without VAS . That study also showed that while urinary losses of retinol were associated with low retinol concentrations in children with dysentery, other inflammatory markers such as body temperature and serum α-1-acid glycoprotein and C reactive protein concentrations were more highly and negatively correlated with vitamin A status. There is some evidence that diarrhea could be mediating this relationship, as revealed by independent associations between diarrhea, low WAZ, and VA levels . Shigellosis, in particular, increases the risk of VAD . A study in Brazil showed a possible interaction between SAM and low serum retinol concentrations for higher diarrheal morbidities . Evidence from RCTs also finds that high-dose VAS may be beneficial for treating severely malnourished children in cases of severe diarrhea [27, 31]. Again, the mechanism by which VA may be operating to mitigate severe diarrhea in SAM has not been elucidated, but it may be either through the repair of the gut epithelium or immune pathways that restore balance between T-cell subsets . Two studies showed unequivocally the benefit of lose-dose (5000 IU daily until discharge) compared to a single high-dose (200,000 IU for children over 12 months or 100,000 IU for children under 12 months on day 1 of hospitalization) VAS regimen [26, 33]. The low-dose regimen was more strongly correlated with lower incidence and shorter duration of respiratory disease  and a lower incidence of severe diarrhea . A third study in Bangladesh also examined the administration of a lose-dose protocol in relation to a high-dose on day 1 followed by daily low doses until hospital discharge. . That study did not find any differences in the two groups on a range of morbidity and nutrition recovery outcomes and adverse events. All children at baseline had diarrhea and while clinical signs of VAD were not apparent, baseline measures of VA status did indicate VAD in the sample. With regards to other morbidities, high-dose VAS was effective in reducing measles-specific respiratory illness [21, 22], but showed mixed results with regards to non-measles pneumonia and other acute lower respiratory tract infections in children with SAM [23–25, 28–30, 32, 37, 38]. Only one trial identified in this review specifically included children who were HIV + . Sub-group analyses stratified by HIV status showed a trend towards a protective effect of high-dose VAS on cough and rapid respiratory rate for HIV-infected children [RR 0.54 (0.24-1.20), p = 0.07], while children without HIV infection were at increased risk for these conditions [RR 1.47 (1.16-1.86), p = 0.001]. Because children infected with HIV are highly vulnerable to SAM and VAD, more research is needed to understand the optimal protocols for this population . The evidence for growth outcomes in the follow-up period from hospital discharge was limited and somewhat dated [20, 22]. One study showed that only among children who were VA deficient at baseline were there greater improvements in weight and MUAC in those who received high-dose VAS; this was not evident in the non-VA deficient children and high-dose VAS even reduced height gain among non-VA deficient girls . Standard therapeutic foods designed for growth recovery in SAM may be a safer source of VA in certain cases. The foods contain VA as retinyl acetate, similar to VA supplements, in the following concentrations (per 100 g): F-75, 900 μg; F-100, 800 μg; and RUTF, 800–1100 μg. Thus, for a child weighing 5 kg, this would translate into 1,119 μg/d VA for F-75, or 1,544 μg/d VA for F-100, and 1,680 μg/d VA for RUTF. These quantities are comparable to the low-dose regimen of 5000 IU or 1500 μg retinol and are well below the high-dose recommendation of 100,000 IU or 30,000 μg/d VA that would be given to children under 12 mo. While these foods have not specifically been assessed as alternatives to VAS, the safety and efficacy of these products in the treatment of SAM is well-accepted [40–42]. Particularly in cases when a child’s VA status is unknown or adequate, therapeutic foods could thus serve as the delivery mechanism for low-dose VAS, though more research is needed. Adverse effects found to be associated with high-dose VAS warrant more research. The most frequent negative outcome was an increased risk of acute respiratory infections [23, 28, 31, 33]. There was also evidence of an increased risk of acute, non-severe diarrhea, mediated in part by nutritional status [26, 31, 32]. It should be noted that the adverse effects arising from high-dose VAS were found in samples or sub-samples that included primarily adequately nourished children. Heterogeneity in baseline characteristics and study design complicates comparisons across the various studies, but these safety issues should not be ignored. Excessive intake of preformed VA, notably in the absence of dietary fatty acids, may overwhelm the esterification process and introduce more harmful forms of VA into the child’s circulation . Further along the metabolic pathway, VA presented to cell membranes in forms other than the RBP complex (as may be the case in SAM) can also lead to significant cellular damage . Carotenoid forms of VA or lipid-based nutrient supplements such as RUTF, should be explored to minimize oxidative stress while still addressing VAD . In the treatment of children with SAM, a high-dose VAS protocol can be safely recommended in cases presenting with measles, severe diarrhea (shigellosis), or symptoms of VAD. More research is needed to study this specific question in populations exclusively malnourished and to understand and prevent adverse outcomes related to high-dose VAS. We recommend exploration of alternative low-dose protocols and strategies beyond VAS, such as use of carotenoids or RUTF interventions, to address VA deficiency and associated health outcomes in the treatment of children with SAM. Funding was provided by the World Health Organization (WHO) to support the work of M. Manary and L. Iannotti. There were no competing interests in this research. LLI, IT, and MJM contributed to the conception and design of the study. IT and MJM supervised the literature search and initial screening of studies. LLI carried out the full text review and initial GRADE assessment, followed by additional assessment from IT and MJM. All authors contributed to the analysis and interpretation of the compiled evidence. LLI drafted the manuscript with significant inputs received by IT and MJM. All authors have granted approval to this version of the manuscript.